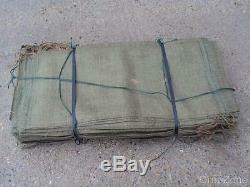 British Military Army Issue Large Hessian Sand Bags Sacks x 100, Flood Defence. 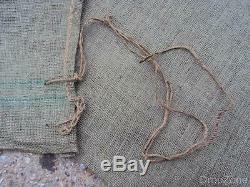 British Military Large Hessian Sand Bags Sacks. Overall they measure 36 x 83cm, the string to tie off the bag is 75cm up from the base. They come in bales of 100. Add me to your Favorite Sellers. View My Other Items For Sale. Cheques which take 5-7 days to clear. Postal Order - uncrossed are treated as cash, crossed takes 5-7 days to clear as with cheque payments. Please note that we do not send items over the weekend, our last post is approx 12pm on Friday. Courier items may take longer as we need to book collections 24hours in advance. Couriers do not collect over the weekend therefore items finishing on a Thursday may not be collected until the following Monday. If Hermes is offered as a postal service please note they currently do NOT deliver to business addresses or remote areas. These include Isle of Man, Channel Islands, Northern Ireland, Scottish Highlands, etc. It is the buyers responsibility to cover the cost to return the item by recorded post unless otherwise agreed. We have been trading in Military Surplus, Collectables and Land Rover Spares for over 22 years and currently have a 6000 sq. Warehouse based in West Sussex. 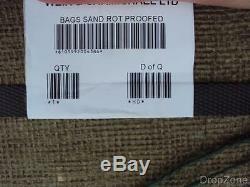 The item "British Military Army Issue Large Hessian Sand Bags Sacks x 100, Flood Defence" is in sale since Monday, May 18, 2015. This item is in the category "Collectables\Militaria\Surplus/ Equipment\Field Gear". The seller is "dropzonemilitary" and is located in Chichester. This item can be shipped worldwide.